In this period, at ACE Innovation, we are working on FMCW Radar for some applications about landslide detection, water level detection in river and, more in general, about distance detection with high resolution. In this post, and others in near future, we want write about FMCW radar. These articles have been thinking for academic studends or everyone knows a little of math. FMCW (Frequency Modulated Continuous Wave) radar differs from pulsed radar in that an electromagnetic signal is continuously transmitted. The frequency of this signal changes over time, generally in a sweep across a set bandwidth. 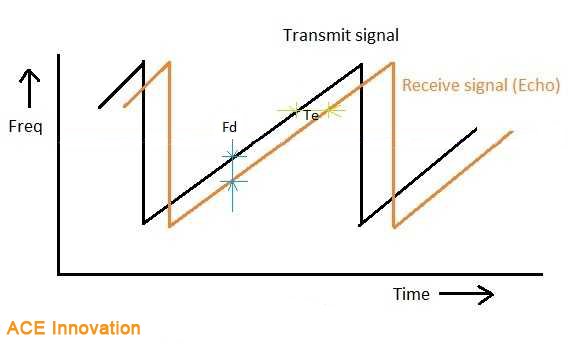 The difference in frequency between the transmitted and received (reflected) signal is determined by mixing the two signals, producing a new signal which can be measured to determine distance or velocity. A sawtooth function is the simplest, and most often used, change in frequency pattern for the emitted signal. Frequency Modulated Continuous Wave radar differs from classical pulsed radar systems in that an RF signal is continuously output. Consequently, time of flight (ToF) to a reflecting object can not be measured directly. Instead, the FMCW radar emits an RF signal that is usually swept linearly in frequency. The received signal is then mixed with the emitted signal and due to the delay caused by the time of flight for the reflected signal, there will be a frequency difference that can be detected as a signal in the low frequency range. A schematic presentation is shown in Figure 2. Figure 2: Schematic presentation showing how a low frequency signal is generated by mixing the received RF signal with the output RF signal. Due to the delay, Δt, caused by emitted signal traveling the distance to the reflector and back to the receiver, there will be a small difference in signal frequency between the two RF signals. This is output as an IF-signal with frequency Δf. where BW is the frequency sweep bandwidth. 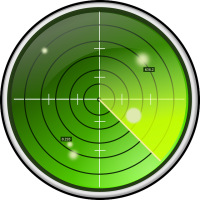 where d is the distance between the radar antenna and the reflector and c is the speed of light. In the next article a simple example and more details.